Now that this year’s Healthy Living Summit has already sold out, I figured it was about time to use up the last of the contents of my swag bag from last year. One of the items in the bag was a mini box of vegetable pasta shells. The little box said that it contained two servings. Um, yeah, maybe if you’re a 60 pound 7 year old. Not for me. I think the reason that I hadn’t used this pasta prior to tonight is that the box is roughly the size of my palm. And honestly, when I eat pasta, I EAT pasta. And the fact that they were trying to tell me that I needed to split the box into two whole servings sort of turned me off. But tonight, I finally got over myself and cooked it. I wanted something simple and healthy to go with the pasta, so I whipped up a little easy peanut sauce and veggies. 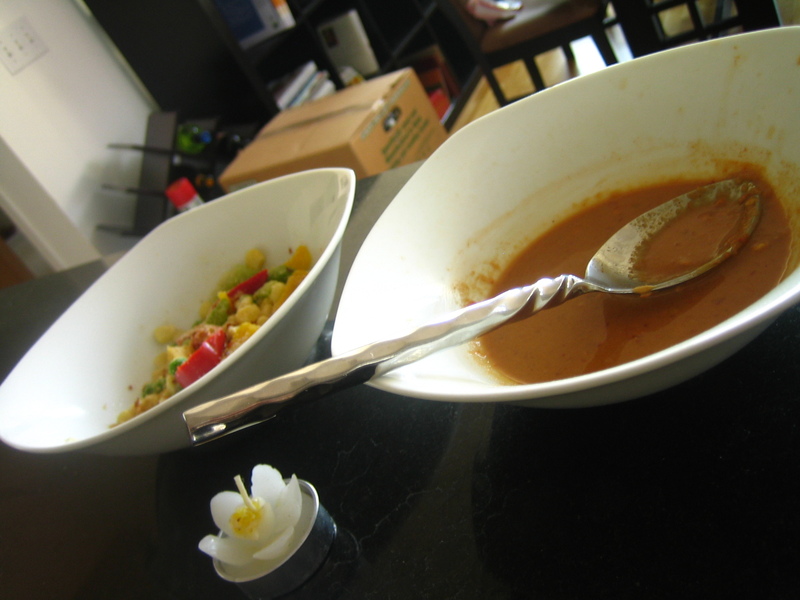 The peanut sauce is my usual combination of a tablespoon or so of peanut butter, a teaspoon or so of garlic chili paste (I like some serious kick), a few splashes of soy sauce, and a few splashes of water. My measurements are super technical- don’t screw it up. Once the sauce is mixed, I heat it in the microwave to help it come together. As for the veggies, all I did was defrost some frozen corn, sweet peas and bell pepper strips in a microwave safe bowl. I sprinkled some onion powder, garlic salt and crushed red pepper (again with the heat, I know!) right onto the veggies and stirred it all together. 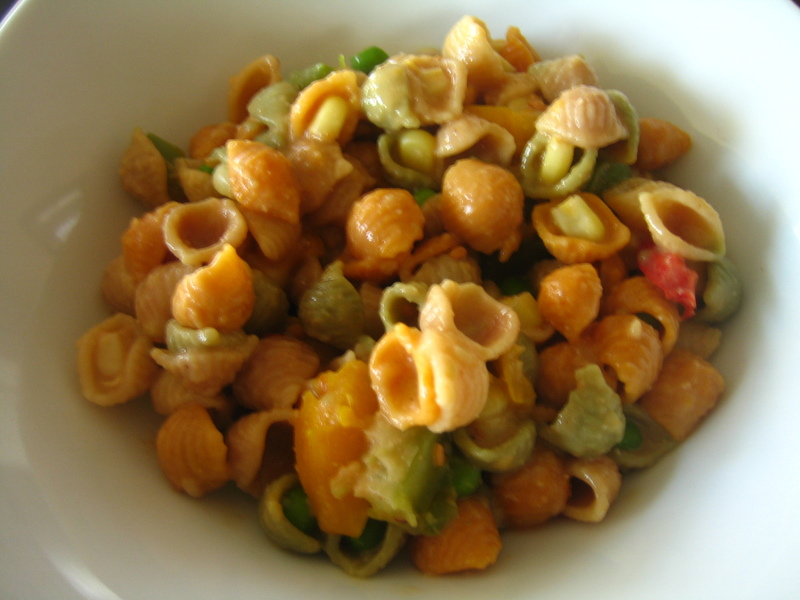 Once the pasta was done cooking I tossed it with the seasoned vegetables and peanut sauce. Total time to make this dish? Well, once I had the water boiling and dropped the pasta in, nuked the veggies and mixed the sauce I’d say I was in for about 10 minutes. Not bad for a Tuesday night. And I even had time to do some laundry. Good thing I finally got over myself and used that pasta, huh? Who eats like an ounce of pasta? Ha! Pasta servings are for the birds. Who can only eat that much. Peanut sauce and pasta sounds like a good combo! I like how the corn kernels are all in the shells. That’s the best part of shell pasta – little surprises in every one! burn but can be very tough on the body! I need mass quantities of pasta when I eat it also. One “serving” just will not do. I’m glad I’m not the only one who lets food samples sit around for months on end….I had to clean out my “food show drawer” when we moved…scary stuff! 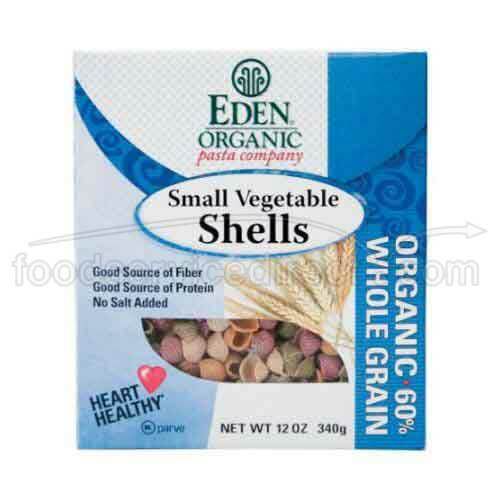 I love Eden Organic pasta, especially the tri-color! Glad you enjoyed it. Yum! I’d have put some sriracha sauce in it too!